– Bring large pot of salted water to bowl. – Cook noodles according to package instructions. – When done, drain and rinse well under hot water. – Wash rapini and trim off 1/2 inch off ends. – Trim rapini into 1 inch pieces leaving some of the leaves. – In a large frying pan combine 4 cloves crushed garlic, ginger, 2 tablespoons sesame oil, a giant pinch of sea salt, green onions, and 1/4 teaspoon of red pepper flakes. – Sauté over med-low heat for 2-3 minutes stirring frequently, until softened. 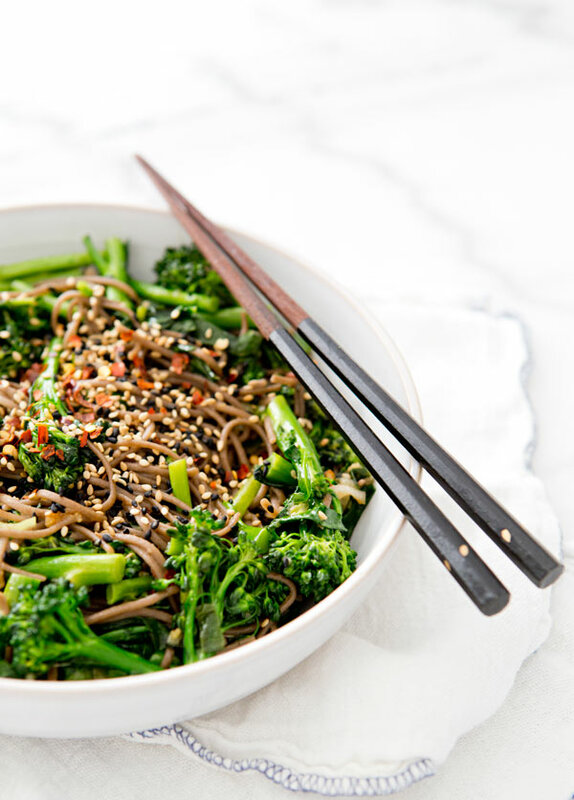 – Add rapini to frying pan and mix well. – In a small bowl combine Tamari, Mirin, 1 tablespoon sesame oil and 2 cloves crushed garlic. 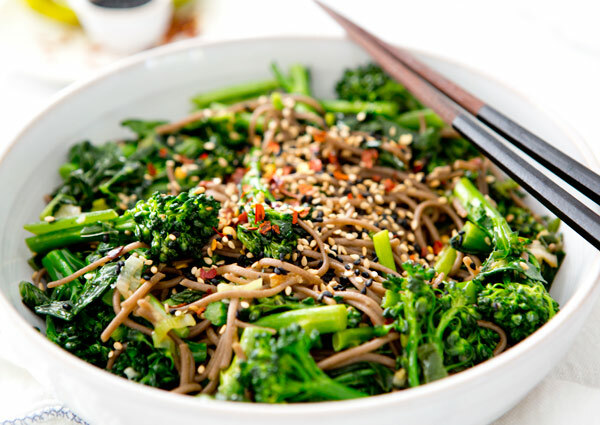 – Add noodles and tamari mixture to rapini. Cook for one additional minute. – Garnish with sesame seeds and a squeeze of lime over each serving. – Add additional red pepper flakes to taste for a little more heat! Hi, i've never posted on a blog before, this is my first, but i just discovered your blog and i wanted to thank you for sharing your wonderful recipes, i have lots of new things to try to make now :). YUM. This looks so delicious! I made your wild rice and broccolini recipe the other day and it really hit the spot. Thank you for this blog! Things I need to try, stat. oh my goodness. Making! making! i'm in love. What a great looking dish. 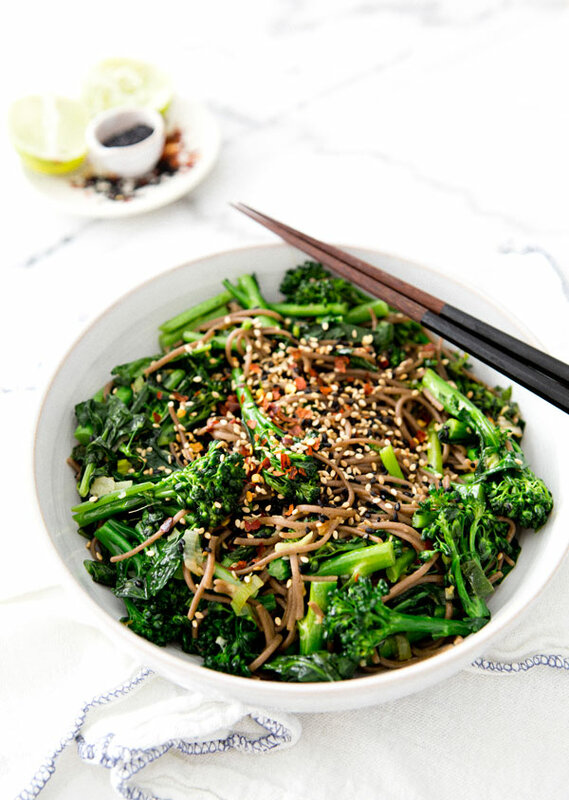 I adore veggie noodle bowls and this looks perfect! 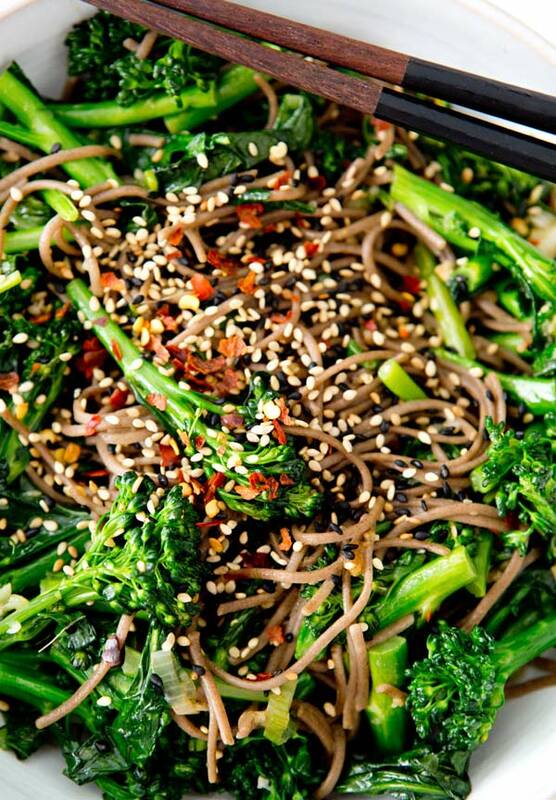 I love the pepperiness of rapini — such a great combo with the earthiness of the soba noodles! Made this yesterday using broccoli instead of rapini. Such a quick-to-make, tasty lunch! Next time, I'll add some salmon and avocado. Hi Sarah, thank you for the lovely recipe! I made it with flowering shoots of napa cabbage and broccoli florets from our garden and it was so appropriately spring-like! This recipe looks amazing! We would love to have it paired with our Andy Boy Broccoli Rabe! my breakfast colming again to read other news. 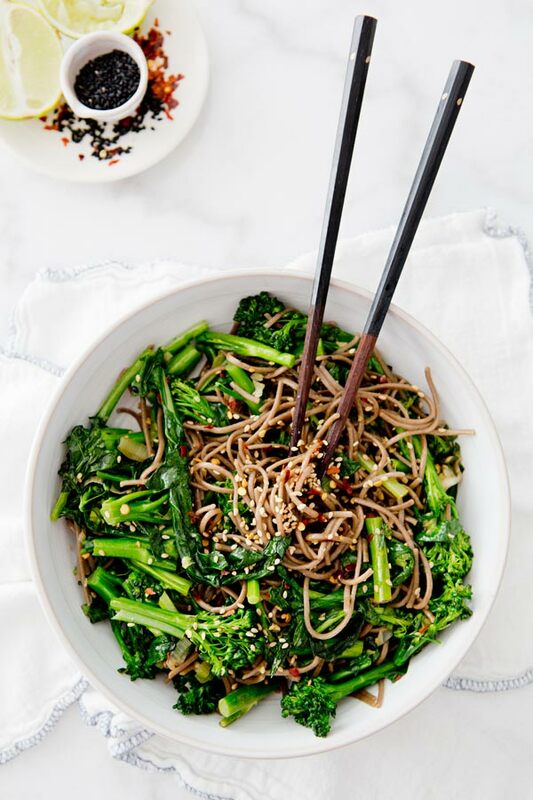 I loved the texture of this dish and the sauce (though would add a little extra sea salt), but I found the rapini really bitter! Maybe it is because it is the wrong season but I would definetly use brocolli or brocollini instead if I made it again.